Soaring food prices have lead to riots across the globe, and Pro-US dictators (who help prop up the dollar by buying billions of US weapons and treasuries year after year) like Egypt's Mubarak got overthrown. Likewise, Nations like China, dealing with nasty food inflation, are appreciating their currency (selling dollars) in an effort to contain the situation. Finally, higher food prices mean higher inflation putting upward pressure on interest rates (and a government 14+ trillion in debt can’t afford higher interest rates). So in order to keep the dollar alive little longer, the Treasury's ESF has been using all the resources at its disposal (the propaganda network it controls and the executive branch that it dominates) to keep food prices down. Below are ten ESF schemes behind cheap food. Fake Designer Bags are cheaper than the real thing. The same applies to food. When inferior food is substituted at every layer of the supply chain and sold the unsuspecting consumers, the result is lower prices. The Sun-Sentinel reports that Fish fraud means what's on your plate may be an impostor. Seafood fraud is a problem in some parts of the industry, according to a recent report, "Bait and Switch: How Seafood Fraud Hurts Our Oceans, Our Wallets and Our Health," issued by the national conservation group Oceana. The report cites recent studies showing that 25 PERCENT TO 70 PERCENT OF THE TIME, FISH SOLD IN THE UNITED STATES AS RED SNAPPER, WILD SALMON AND ATLANTIC COD IS ACTUALLY LESS DESIRABLE, CHEAPER FISH that is more readily available. ONLY TWO OUT OF 20 SAMPLES OF RED SNAPPER WERE THE REAL THING. That delectable fish – Lutjanus campechanus, native to the Gulf of Mexico and Atlantic waters – is one of the most frequently impersonated by a fake. That's how he once discovered 3,000 pounds of "grouper" he had bought was actually farm-raised catfish from Southeast Asia. There were clues: The fillets were not as thick as they should have been, and the flesh didn't have grouper's characteristic reddish tinge. Fish substitutions can pose health risks, potentially exposing consumers to naturally occurring toxins — such as ciguatera in reef fish — that cause illness, according to the Oceana report. And if a less costly fish is substituted, CONSUMERS ARE PAYING A HIGHER PRICE FOR SOMETHING THEY ARE NOT GETTING. If you find cheap prices on seafood … , there could be a good reason — a lesser fish is masquerading as a pricier cousin. ABC News reports that Ingredients in Taco Bell Beef and Fast Food Meat. Today's Special: Ammonia-Treated Meat Scraps? How much meat is in your Taco Bell taco filling? How much is in your McDonald's Quarter Pounder or your Burger King Whopper? And is this meat really meat--OR SOMETHING ELSE? Kantha Shelke, chief science officer of Corvus Blue LLC, a Chicago food science and nutrition research firm, says it's frankly impossible for a consumer to know how much meat is in a food item at Taco Bell, McDonalds, Burger King or any other fast food restaurant. That's because such disclosure is not required. Even when an item is touted as being "all-beef," it may be only 70 percent meat and not run afoul of regulations. As for the meat itself, some of it can be…well, not exactly what you think of when you think of meat. Bill Marler, an plaintiffs' attorney specializing in food safety lawsuits, says that it's common for up to 10 percent to 12 percent of that juicy burger you're about to pop into your mouth to be "ammoniated beef product"—scraps and trimmings left over from slaughter THAT USED TO BE RELEGATED FOR USE IN PET FOOD. They no longer are, thanks to a treatment process that uses ammonium hydroxide to protect meat made from scraps against bacterial contamination, thus rendering it fit--at least according to regulators--for human consumption. The product is produced by Beef Products Inc. of South Dakota, whose website says that if you're eating a hamburger in a "quick-service restaurant" (the food industry's preferred term for fast food), "...chances are you'll be eating product produced by BPI." The fast-food industry's meat magic doesn't stop at burgers: The steak you're eating may not be what you expect. Shelke says some middle-market steak house chains serve "FABRICATED STEAK"—an FDA term referring to steak-like objects formed from pulverized flesh. "The end result looks like a beefsteak but in reality has been extruded. Meat is broken down into its components and then re-formed to look like the original. You think you're getting the same steak as if you were at a real Texas steakhouse." The telltale sign that you're not is the meat's uniformity: all the steaks have the same look, size and same consistency. Another clue: Steaks right off the steer have marbling; they have tendons. Fabricated steaks have neither. Achieving consistency the old fashioned way is labor intensive and expensive. … Fabricating them is easier and CHEAPER. Independent Online explains The truth about food fraud. Food fraud is big business. The UK Food Standards Agency believes that around 10 per cent of our weekly shopping may be counterfeit. Many of the everyday goods that we buy - honey, orange juice, ham, butter and coffee - generate serious money for the food criminals. From printing misleading labels to diluting or modifying the food itself, it's easier than ever for suppliers to dupe consumers. … Are you still sure that you know exactly what you're buying? Bulking up a chicken breast with water is an old supplier's trick, but the FSA had not realised how widespread the problem was until it conducted a snap survey in 2001. Its investigation found that almost half the frozen chicken breasts they examined had a meat content of between 5 and 26 per cent less than appeared on packaging, and that some chicken breasts contained as much as 43 per cent added water. Breakfasts around the country were spoilt by two recent announcements from Defra. The first was that, following an investigation of imported eggs in north London, one in 30 boxes was found to contain salmonella. The second was that around 30 million eggs may have been wrongly labelled as free range. Watch out, bolognese enthusiasts: that extra-lean mince might not be so low-fat after all. The Association of Public Analysts' recent survey suggests that much of the minced beef, lamb, pork, turkey and chicken that claims to be a reduced-fat alternative is, in fact, just as unhealthy as "standard" mince. A total of 27 per cent of all mince types are now labelled as "lean" and "extra lean". Genetically modified rice should not be on sale in Britain. It is illegal here, just as it is in all EU countries. But in September, several types of GM rice were found in British supermarkets. The problem started when the Bush administration admitted it had found genetically modified material in some American long-grain rice that was ready for export. This GM rice had been developed by Bayer CropScience to tolerate weedkiller and had spread around the US as a result of cross-pollination. The European Commission has since stated that this GM rice has been found in 33 out of 162 samples of imported US rice. … An investigation launched into the sale of bogus organic meat carried out earlier this year revealed that many farmers and traders are passing off non-organic meat as the more expensive organic variety. Thanks to what-used-to-be-dog-food being sold at fast food restaurants around the world, food is prices are cheaper. As with anything, it is possible to go over the limit to achieve short gains at the expense of sacrificing the future (for example: an athlete can ignore an injury to win a tournament, but do permanent damage to his body in the process). The same is true in agriculture. To keep food cheap, the ESF has promoted the use of high-yielding, destructive farming techniques in arid regions which could not support them. This increases production initially, but then slowly turns the land into a desert where nothing will grow. Treasury interference in US market corrupted corporate culture. Bankers started behaving like there was no tomorrow because they knew something was fundamentally wrong with the system. They started pursuing business practices which can only be described as "picking up pennies in front of a steamroller". Most the world has adopted intensive farming techniques which is degrading farmland. I have already written about how disaster is Feared As Desertification Spreads. 6) Desertification was one the sources of the global food crisis of 2008. Degradation of available farmland contributes to less food production and higher prices for staple crops like rice, wheat and corn. Lets first be clear about something: the desertification happening around the world isn’t the result of global warming (thought it is possible global warming is making it worse). The desertification we are seeing, in every case, is clearly the result of reckless and extensive overuse of drylands around the world. A) Do nothing and let food output slowly drops as agricultural land turns into sand dunes. No matter what actions governments take, the only certainty is that global grain output will drop significantly. The Treasury's ESF is directly responsible for the destructive farming techniques wrecking havoc in the world today. Take, for example, ESF's intervention (through the CIA) in Indian agriculture. "Someday someone must give the American people a full report of the work of the Ford Foundation in India. The several million dollars in total Ford expenditures in the country do not tell one-tenth of the story." - Chester Bowles (former US ambassador to India). The CIA's infiltration of US foundations in general was massive. A 1976 Select Committee of the US Senate discovered that during 1963-66, of 700 grants each of over $10,000 given by 164 foundations, at least 108 were partially or wholly CIA-funded. According to Petras, "The ties between the top officials of the FF and the U.S. government are explicit and continuing. A review of recently funded projects reveals that the FF has never funded any major project that contravenes U.S. policy." In 1959, a team led by a US department of agriculture economist produced the Ford Foundation's Report on India's Food Crisis and Steps to Meet It. In place of institutional change (ie redistribution of land and other rural assets) as the key-stone to agricultural development, this report stressed technological change (improved seeds, chemical fertilisers, and pesticides) in small, already irrigated, pockets. This was the 'Green Revolution' strategy. Ford even funded the Intensive Agricultural Development Programme (IADP) as a test case of the strategy, providing rich farmers in irrigated areas with subsidised inputs, generous credit, price incentives, and so on. The World Bank too put its weight behind this strategy. The 'Green Revolution' strategy has lead to disaster in India. The Wall Street Journal reports that Green Revolution in India Wilts as Subsidies Backfire. SOHIAN, India—India's Green Revolution is withering. In the 1970s, India dramatically increased food production, finally allowing this giant country to feed itself. But government efforts to continue that miracle by encouraging farmers to use fertilizers have backfired, forcing the country to expand its reliance on imported food. Popularized during the Green Revolution of the 1960s and 1970s, fertilizers helped boost crop yields and transformed India into a nation that could feed itself. But now their overuse is degrading the farmland. As the soil's fertility has declined, farmers under pressure to increase output have spread even more urea on their land. Kamaljit Singh is a 55-year-old farmer in the town of Marauli Kalan in the state of Punjab, the breadbasket of India. He says farmers feel stuck. "The soil health is deteriorating, but we don't know how to make it better," he says. "As the fertility of the soil is declining, more fertilizer is required." In the early years after India gained independence in 1947, the country couldn't even dream of feeding its population. Importing food wasn't possible because India lacked the cash to pay. India relied on food donated by the U.S. government. In 1967, then-Prime Minister Indira Gandhi imported 18,000 tons of hybrid wheat seeds from Mexico. The effect was miraculous. The wheat harvest that year was so bountiful that grain overflowed storage facilities. In the northern state of Punjab, Bhupinder Singh, a turbaned, gray-bearded 55-year-old farmer, stood barefoot in his wheat field in December and pointed to the corner where he had just spread a 110-pound bag of urea. "Without the urea, my crop looks sick," he said, picking up a few stalks of the young wheat crop and twirling them in his fingers. "THE SOIL IS GETTING WEAKER AND WEAKER OVER THE LAST 10 TO 15 YEARS. We need MORE AND MORE UREA TO GET THE SAME YIELD." Mr. Singh farms 10 acres in Sohian, a town about 25 miles from the industrial city of Ludhiana. He said his yields of rice have fallen to three tons per acre, from 3.3 tons five years ago. By using twice as much urea, he's been able to squeeze a little higher yield of wheat from the soil—two tons per acre, versus 1.7 tons five years ago. He said both the wheat and rice harvests should be bigger, considering that he's using so much more urea today than he did five years ago. ADDING UREA DOESN'T HAVE THE EFFECT IT DID IN THE PAST, he said, but it's so cheap that it's better than adding nothing at all. "The future is not good here," he said, shaking his head. Deteriorating soil health had lead to desertification in India. Caritas.org reports about desertification in India. As I have written before, India faces a bleak future. The Chart below shows worldwide growth in fertilizer use. Notice India’s 54 percent increase in fertilizer use over the last ten years. Chart below shows India’s wheat output. The red bar highlights the last ten years (where India's fertilizer use increase 54 percent). The green bar highlights the start of India’s “green revolution”. Now look at what happened with India’s population since the Green Revolution began. 1) Switch to more sustainable farming methods and try to feed twice the population with pre-“green revolution” grain production levels. 2) Continue “green revolution” farming methods and watch deteriorating soil health and desertification slowly eat away at grain production. Both of these choices involve a lot of people not having food any more. Seems India is somewhat screwed. By tapping your savings, it is possible to live above your means, temporarily. In its quest for cheap food, The ESF has promoted the use of nonreplenishable resources (the world’s “savings”) to boost agricultural production. Two examples of this are the overpumping aquifers and the use natural gas (fossil fuel) to produce nitrogen fertilizer. Like most ESF schemes, this is now reaching the breaking point. The Encyclopedia Of Earth reports about aquifer depletion. For fossil aquifers—such as the vast U.S. Ogallala aquifer, the deep aquifer under the North China Plain, or the Saudi aquifer—DEPLETION BRINGS PUMPING TO AN END. Farmers who lose their irrigation water have the option of returning to lower-yield dryland farming if rainfall permits. In more arid regions, however, such as in the southwestern United States or the Middle East, THE LOSS OF IRRIGATION WATER MEANS THE END OF AGRICULTURE. Falling water tables are already adversely affecting harvests in some countries, including China, the world's largest grain producer. A groundwater survey released in Beijing in August 2001 revealed that the water table under the North China Plain, which produces over half of that country's wheat and a third of its corn, is falling faster than earlier reported. Overpumping has largely depleted the shallow aquifer, forcing well drillers to turn to the region's deep fossil aquifer, which is not replenishable. The survey, conducted by the Geological Environmental Monitoring Institute (GEMI) in Beijing, reported that under Hebei Province in the heart of the North China Plain, the average level of the deep aquifer was dropping nearly 3 meters (10 feet) per year. Around some cities in the province, it was falling twice as fast. He Qingcheng, head of the GEMI groundwater monitoring team, notes that as the deep aquifer is depleted, the region is losing its last water reserve-its only safety cushion. He Qingcheng's concerns are mirrored in a World Bank report: "Anecdotal evidence suggests that deep wells [drilled] around Beijing now have to reach 1,000 meters [more than half a mile] to tap fresh water, adding dramatically to the cost of supply." In unusually strong language for a Bank report, it foresees "CATASTROPHIC CONSEQUENCES FOR FUTURE GENERATIONS" unless water use and supply can quickly be brought back into balance. The U.S. embassy in Beijing reports that wheat farmers in some areas are now pumping from a depth of 300 meters, or nearly 1,000 feet. Pumping water from this far down raises pumping costs so high that farmers are often forced to abandon irrigation and return to less productive dryland farming. Falling water tables, the conversion of cropland to nonfarm uses, and the loss of farm labor in provinces that are rapidly industrializing are combining to shrink China's grain harvest. The wheat crop, grown mostly in semiarid northern China, is particularly vulnerable to water shortages. After peaking at 123 million tons in 1997, the harvest has fallen in five of the last eight years, coming in at 95 million tons in 2005, a drop of 23 percent. The U.S. embassy also reports that the recent decline in rice production is partly a result of water shortages. After peaking at 140 million tons in 1997, the harvest dropped in four of the following eight years, falling to an estimated 127 million tons in 2005. Only corn, China's third major grain, has thus far avoided a decline. This is because corn prices are favorable and because the crop is not as irrigation-dependent as wheat and rice are. Overall, China's grain production has fallen from its historical peak of 392 million tons in 1998 to an estimated 358 million tons in 2005. For perspective, this drop of 34 million tons exceeds the annual Canadian wheat harvest. China largely covered the drop-off in production by drawing down its once vast stocks until 2004, at which point it imported 7 million tons of grain. A World Bank study indicates that China is overpumping three river basins in the north--the Hai, which flows through Beijing and Tianjin; the Yellow; and the Huai, the next river south of the Yellow. Since it takes 1,000 tons of water to produce one ton of grain, the shortfall in the Hai basin of nearly 40 billion tons of water per year (1 ton equals 1 cubic meter) means that when the aquifer is depleted, THE GRAIN HARVEST WILL DROP BY 40 MILLION TONS--enough to feed 120 million Chinese. Of the leading grain producers, only China has thus far experienced a substantial decline in production. Even with a worldwide grain crunch and climbing grain prices providing an incentive to boost production, it will be difficult for China to regain earlier grain production levels, given the loss of irrigation water. Serious though emerging water shortages are in China, they are even more serious in India simply because the margin between actual food consumption and survival is so precarious. In a survey of India's water situation, Fred Pearce reported in the New Scientist that the 21 million wells drilled in this global epicenter of well-drilling are lowering water tables in most of the country. In North Gujarat, the water table is falling by 6 meters (20 feet) per year. In Tamil Nadu, a state with more than 62 million people in southern India, wells are going dry almost everywhere. According to Kuppannan Palanisami of Tamil Nadu Agricultural University, falling water tables have dried up 95 percent of the wells owned by small farmers, reducing the irrigated area in the state by half over the last decade. As water tables fall, well drillers are using modified oil-drilling technology to reach water, going as deep as 1,000 meters in some locations. In communities where underground water sources have dried up entirely, all agriculture is rain-fed and drinking water is trucked in. Tushaar Shah, who heads the International Water Management Institute's groundwater station in Gujarat, says of India's water situation: "When the balloon bursts, untold anarchy will be the lot of rural India." At this point, the harvests of wheat and rice, India's principal food grains, are still increasing. But within the next few years, [in 2011 (five years since article was written, it has already begun] the loss of irrigation water could override technological progress and start shrinking the harvest in some areas, as it is already doing in China. In the United States, the USDA reports that in parts of Texas, Oklahoma, and Kansas--three leading grain-producing states--the underground water table has dropped by more than 30 meters (100 feet). As a result, wells have gone dry on thousands of farms in the southern Great Plains. Although this mining of underground water is taking a toll on U.S. grain production, irrigated land accounts for only one-fifth of the U.S. grain harvest, compared with close to three-fifths of the harvest in India and four-fifths in China. The water shortage in Baluchistan is province-wide. Sardar Riaz A. Khan, former Director of Pakistan's Arid Zone Research Institute in Quetta, reports that six basins have exhausted their groundwater supplies, leaving their irrigated lands barren. Khan expects that within 10-15 years virtually all the basins outside the canal-irrigated areas will have depleted their groundwater supplies, depriving the province of much of its grain harvest. Future irrigation water cutbacks as a result of aquifer depletion will undoubtedly reduce Pakistan's grain harvest. Countrywide, the harvest of wheat--the principal food staple--is continuing to grow, but more slowly than in the past. Craig Smith writes in the New York Times, “From the air, the circular wheat fields of this arid land’s breadbasket look like forest green poker chips strewn across the brown desert. But they are outnumbered by the ghostly silhouettes of fields left to fade back into the sand, places where the kingdom’s gamble on agriculture has sucked precious aquifers dry.” Some Saudi farmers are now pumping water from wells that are 4,000 feet deep, nearly four-fifths of a mile (1 mile equals 1.61 kilometers). A 1984 Saudi national survey reported fossil water reserves at 462 billion tons. Half of that, Smith reports, has probably disappeared by now. This suggests that irrigated agriculture could last for another decade or so and then will largely vanish [Saudi Arabia is phasing out wheat production by 2016], limited to the small area that can be irrigated with water from the shallow aquifers that are replenished by the kingdom’s sparse rainfall. It is a classic example of an overshoot-and-collapse food economy. In neighboring Yemen, a nation of 21 million, the water table under most of the country is falling by roughly 2 meters a year as water use outstrips the sustainable yield of aquifers. In western Yemen’s Sana’a Basin, the estimated annual water extraction of 224 million tons exceeds the annual recharge of 42 million tons by a factor of five, dropping the water table 6 meters per year. World Bank projections indicate the Sana’a Basin-—site of the national capital, Sana’a, and home to 2 million people—-will be pumped dry by 2010. In the search for water, the Yemeni government has drilled test wells in the basin that are 2 kilometers (1.2 miles) deep-—depths normally associated with the oil industry—-but they have failed to find water. Yemen must soon decide whether to bring water to Sana’a, possibly by pipeline from coastal desalting plants, if it can afford it, or to relocate the capital. Either alternative will be costly and potentially traumatic. Israel, even though a pioneer in raising irrigation water productivity, is depleting both of its principal aquifers—-the coastal aquifer and the mountain aquifer that it shares with Palestinians. Israel’s population, whose growth is fueled by both natural increase and immigration, is outgrowing its water supply. Conflicts between Israelis and Palestinians over the allocation of water in the latter area are ongoing. Because of severe water shortages, Israel has banned the irrigation of wheat. In Mexico-—home to a population of 107 million that is projected to reach 140 million by 2050—-the demand for water is outstripping supply. Mexico City’s water problems are well known and rural areas are also suffering. For example, in the agricultural state of Guanajuato, the water table is falling by 2 meters or more a year. At the national level, 51 percent of all the water extracted from underground is from aquifers that are being overpumped. The New York Times reports about the shortages threaten farmers' key tool: fertilizer. … the widespread use of inexpensive chemical fertilizer, coupled with market reforms, helped power an agricultural explosion here that had already occurred in other parts of the world. Yields of rice and corn rose, and diets grew richer. Some kinds of fertilizer have nearly tripled in price in the last year, keeping farmers from buying all they need. That is one of many factors contributing to a rise in food prices that, according to the United Nations' World Food Program, threatens to push tens of millions of poor people into malnutrition. The thing about living beyond your means by tapping your savings is that it is very painful when those savings run out. GM Technology is an integral part of the ESF cheap food strategy (it is an extension of the “green revolution”). If you don’t have a negative opinion of GM food, that is thanks to the ESF. Below is a video showing how the news about GM Technology is controlled. Media Corruption & The "Big Six"
For the truth about GM Technology, watch the documentary below. 1) Close down production from the contaminated source, reducing the food supply and raising prices. 2) Allow production to continue, letting contaminated produce into the food supply and keeping prices cheap. Guess which one the ESF encourages? Fishermen harvest some 1.3 billion lb per year of fish, crabs, oysters, and shrimp from the Gulf of Mexico—about 20% of US commercial seafood production. It is easy to understand that if seafood production was shut down for a long period of time, it would drive prices higher. Now, on the April 20, 2010, the explosion of BP's Deepwater Horizon oil rig caused millions of barrels of oil to be dumped into the Gulf of Mexico. This made worse by BP dumped millions of gallons of extremely toxic dispersant (COREXIT) to make the oil dissolve (when you put sugar in tea, it dissolves, but it’s still there). Of course, within two weeks of the disaster the National Oceanic & Atmospheric Administration (NOAA) began closing federal waters to fishing. As long as miles of oil was visibly floating on the water’s surface, no one could be tricked into eating toxic gulf seafood. However, once BP started pouring its incredibly lethal toxic dispersant into the gulf, making the oil “disappear”, NOAA began to reopening large areas, and, by April 19, 2011, the entire gulf was open to fishing. While this helped the ESF keep seafood cheap, it should never have happened. Stuarthsmith.com reports that the fish in the Gulf of Mexico are very sick (and you will be too if you eat them). The National Oceanic and Atmospheric Administration (NOAA) has confirmed – for the first time since the BP disaster – that fish are sick in the Gulf of Mexico. In fact, the number of “sick fish” sightings has risen so dramatically, primarily in federal waters off Alabama, and the risks to humans are becoming such a serious concern that NOAA has released guidelines on what anglers should do when they come across visibly sick fish, including a “minimal to no handling” warning. Many of the reports describe large lesions on the fish, particularly red snapper. And with the June 1 opening of recreational red snapper season, the reports of sick fish are bound to keep rolling in and the risk of human exposure will grow exponentially. Some experts, including many with whom I work, suspect the BP oil spill is connected to the spike. Not much of a surprise there. We’ve been seeing AN UNDENIABLE TREND TOWARD "UNEXPLAINED" OCCURRENCES OF SICK, STRANDED AND DEAD MARINE LIFE – like record numbers of dead dolphins and sea turtles – for months now. The prime suspect, of course, is the 200 MILLION GALLONS OF CRUDE AND THE 2 MILLION GALLONS OF THE TOXIC DISPERSANT COREXIT that continue to foul the Gulf of Mexico. The reports of sick fish correlate with areas most impacted by the BP oil spill, said Jim Cowan Jr., the Louisiana State University Department of Oceanography and Coastal Sciences scientist who is at the center of the sick fish studies off the Alabama coast. The fish had dark lesions on their skin, some the size of a 50-cent piece. On some of them, the lesions had eaten a hole straight through to the muscle tissue. Many had fins that were rotting away and discolored or even striped skin. Inside, they had enlarged livers, gallbladders, and bile ducts. The St. Pete Times quoted Professor Cowan as saying: “The fish have a bacterial infection and a parasite infection that’s consistent with a compromised immune system. There’s no doubt it’s associated with a chronic exposure to a toxin.” Hmmmm, I wonder what that could be? Any ideas? In September 2010, my research team sampled red snapper caught off the coast of Pensacola – and the results are very much in line with the “sick fish” epidemic we’re seeing now. The certified lab results show (see link to my previous post below) the viscera, or internal organs, to be contaminated with nearly 3,000 PPM of total petroleum hydrocarbons. That’s a dangerous level by any standard. Release the fish back into the water with minimal to no handling. Use a fishhook-remover device. Avoid contact with skin, especially if you have cuts or sores on your skin. Document where you caught the fish, and if possible, photograph it. A website is being developed on which anglers may post their findings. Anglers are not advised to keep the sick fish because of the risks of the fish transmitting disease to humans. If you bring in a red snapper with lesions, it does count toward your fishing quota. The “minimal to no handling” recommendation should concern us all, signaling that it may be time take another look at NOAA’s “all clear” declaration on seafood safety. After all, the agency has publicly admitted that the fish shouldn’t be handled, and they may pose health risks if eaten raw. Like Waters, Professor Cowan also believes there are sick fish, not just off Alabama, but across the entire area of the Gulf hit by the BP spill. Research is taking place now to determine if the problem is, in fact, that widespread. The Sea Lab is collecting fish samples this week for further scrutiny by the FDA. A broader survey is poised to begin to determine whether the sick fish extend to areas beyond Alabama coastal waters. And NOAA is setting up a website on which recreational anglers can report any sick fish they find. My guess is that NOAA and the FDA will ultimately confirm that there are sick, contaminated fish all over the northeastern quadrant of the Gulf of Mexico. This is a serious issue that has obvious implications for seafood safety as well as for the overall post-spill health of the Gulf. A highly contaminated link in the food chain can wreak havoc on the rest of the ecosystem. Again, as with the Gulf of Mexico, if all the food contaminated by Fukushima nuclear meltdown was removed from the market, it would significantly drive up prices. This is why ESF is encouraging the distribution and consumption of as much radioactive food as possible. While US media like the New York Times have reported on radioactive food in Japan (see Radiation-Tainted Beef Spreads Through Japan’s Markets), there has been little reporting on radiation in the US food supply. Even as thousands of Japanese workers struggle to contain the ongoing nuclear disaster, low levels of radiation from those power plants have been detected in foods in the United States. Milk, fruits and vegetables show trace amounts of radioactive isotopes from the Fukushima Daichi power plants, and THE MEDIA APPEARS TO BE PAYING SCANT ATTENTION, IF ANY ATTENTION AT ALL. It is as if the problem only involves Japan, not the vast Pacific Ocean, into which highly radioactive water has poured by the dozens of tons, and not into air currents and rainwater that carry radiation to U.S. soil and to the rest of the world. And while both Switzerland and Germany have come out against any further nuclear development, the U.S. the nuclear power industry continues as usual, with AGING AND CRUMBLING POWER PLANTS RECEIVING EXTENDED OPERATING LICENSES FROM THE NUCLEAR REGULATORY COMMISSION, as though it can’t happen here. BUT IT IS HAPPENING HERE, ON YOUR DINNER PLATE. Taking a page from the BP public relations handbook, TEPCO (Tokyo Electric Power Company) and the Japanese government have downplayed the extent of the nuclear disaster at Fukushima Daichi, in which three of six nuclear reactors are in ongoing meltdown. According to Japanese nuclear engineer Naoto Sekimura, nuclear fuel rod meltdown at the damaged plants began only hours after the tsunami, and the situation has not been contained. There is still an ongoing threat of a total “China Syndrome” meltdown, and Japanese officials now say that THE THREE DAMAGED PLANTS MAY POSSIBLY CONTINUE TO EMIT UNCONTROLLED RADIATION FOR ANOTHER YEAR. According to Greenpeace, the ocean around large areas of Japan has been contaminated by toxic radioactive agents including cesium, iodine, plutonium and strontium. These radioactive agents are accumulating in sea life. Fish, shellfish and sea vegetables are absorbing this radiation, while airborne radioactive particles have contaminated land-based crops in Japan, including spinach and tea grown 200 miles south of the damaged nuclear plants. Meanwhile, on U.S. soil, radiation began to show up in samples of milk tested in California, just one month after the plants were damaged. Radiation tests conducted since the nuclear disaster in Japan have detected radioactive iodine and cesium in milk and vegetables produced in California. According to tests conducted by scientists at the UC Berkeley Department of Nuclear Engineering, milk from grass fed cows in Sonoma County was contaminated with cesium 137 and cesium 134. Milk sold in Arizona, Arkansas, Hawaii, Vermont and Washington has also tested positive for radiation since the accident. Additionally, drinking water tested in some U.S. municipalities also shows radioactive contamination. Is the fallout from Fukushima Daichi falling on us? Yes, it is. Thanks to the jet stream air currents that flow across the Pacific Ocean, the U.S. is receiving a steady flow of radiation from Fukushima Daichi. And while many scientists say that the levels of contamination in food pose no significant threat to health, scientists are unable to establish any actual safe limit for radiation in food. Detection of radioactive iodine 131, which degrades rapidly, in California milk samples shows that the fallout from Japan is reaching the U.S. quickly. Though California is somewhat on the ball regarding testing for radiation in foods, other states appear to be asleep at the switch with this issue. Yet broad-leaf vegetables including spinach and kale are accumulating radiation from rain and dust. Some spinach, arugula and wild-harvested mushrooms have tested positive for cesium 134 and 137 according to UCB, as have strawberries. Allowing the sale of lethal food, again, keeps prices cheap. Feeding the starving, of course, requires food. Aid agencies, who are trying to save the hungry, drive food costs up when they raise donations and buy grain on the international market. This is why, whenever there are millions people dying of famine, the ESF uses every tool at its disposal to thwart aid agencies and let the powerless starve. One of the MANY examples of this is North Korea where the US is leading the effort to starve 6 million people. The secretive rogue nation is reportedly facing its deadliest food shortage in years. Why can't Pyongyang feed its people? Is North Korea's food shortage really that severe? The situation is bad, and getting worse. The U.N.'s World Food Program says as many as 6 MILLION OF THE COUNTRY'S 24 MILLION CITIZENS ARE AT RISK OF MALNUTRITION. Government rations have been slashed to give people just 10 percent of what they need for a healthy diet. The European Commission last week offered Pyongyang $14 million in emergency provisions, saying that 500,000 people, many of them already malnourished children, could die of starvation. But THE U.N. SAYS IT WOULD TAKE $210 MILLION IN AID TO PREVENT DIRE SHORTAGES. How are the poor coping? Increasingly, desperate families are risking their lives to cross the border into China. "You see more people out in the fields and on the hillsides digging roots, cutting grass or herbs," says Katharina Zellweger, head of the Swiss Agency for Development & Cooperation in Pyongyang. Others are even more desperate. "Some people are having to eat manure when they cannot get rice or corn," said one refugee, 68-year-old Kim Yeong, as quoted by Britain's Telegraph. Why can't the country's "dear leader," Kim Jong Il, feed his people? There are many contributing factors. The country's "Soviet-style planned economy" is a disaster. MANY COUNTRIES, INCLUDING THE U.S., HAVE STOPPED SENDING FOOD AID IN THE LAST FEW YEARS. … And to make matters worse, North Korea has been through a series of harsh winters and floods, and harvested an unusually weak potato crop this spring. According to video captured by a North Korean man over the course of several months, even the military has joined the ranks of the starving. "I am eight," says one boy. "My father died and my mother left me. I sleep outdoors." … the all-powerful army - once quarantined from food shortages and famine - is starting to go hungry. "Everybody is weak," says one young North Korean soldier. "Within my troop of 100 comrades, half of them are malnourished," he said. Things are so bad that people are apparently resorting to cannibalism. Meanwhile, Washington Wavers while North Koreans Starve. … we hear that North Korea does not need food aid, or it will be siphoned off by the military, or we can’t monitor it, or the regime has funds to take care of any food needs itself, or the problem is perennial because the North Korean agricultural system is awful or (most recently) that the problem is inflated—often all of these claims at once. To be sure, even if lots of kids get stunted and many more women produce defective babies, we will never hear much about it or see it on the tube. We can rest easy. The Telegraph reports that UN DECLARES FIRST FAMINE IN AFRICA FOR THREE DECADES. Tens of millions of dollars in urgently-needed US aid for Somalia are being withheld even as parts of the country are set on Wednesday to be declared a famine zone. Conditions in the country, hit first by war and then by drought, are so severe in some places what was an "emergency" has now tipped into a "catastrophe", the UN will say. In parts of one of the two regions to be officially certified, 10 TIMES THE NUMBER OF PEOPLE ARE DYING THAN THE OFFICIAL THRESHOLD CLASSIFYING FAMINE. Tens of thousands are believed to have already have died in the south of the country. The UN declaration will be the first in a series of "food crises" in the Horn of Africa, and the first time the term famine has officially been used since almost a million Ethiopians starved to death in 1984. But Washington, the world's biggest donor to Somalia until 2009, is now barred from funding food appeals if its money risks "materially benefiting" terrorists. The new rules, FROM THE US TREASURY'S OFFICE OF FOREIGN ASSETS CONTROL [The treasury is leading the campaign to let the poor starve], came into force after reports that al-Shabaab, Somalia's al-Qaeda-linked insurgents, were taxing food convoys, stealing supplies and threatening agencies' workers. Since then, US aid spending in Somalia has fallen by 88 per cent, from more than £150m in 2008 to £13m this year. "Avoiding aid diversion is important, but THE US'S OVERZEALOUS APPROACH LED TO A DAMAGING COLLAPSE IN US HUMANITARIAN SUPPORT TO SOMALIA," he said. "This has undermined humanitarian response and preparedness and other donors have been unable pick up the slack." The Government has pledged another £90m for what David Cameron called "the most catastrophic situation for a generation" in the Horn of Africa. The scale of the outstanding need, however, meant that even "something very creative that has not happened before, like Live Aid" will not be enough, said a senior adviser to one British charity. "It is only government level responses, from across all of the international community, that will have an impact now," he said. The withdrawal of US funds for southern Somalia, coupled with al-Shabaab's long-held belligerence towards foreigners, were "now costing lives", said Mr Konyndyk of Mercy Corps. Under international law, there is no mandated extra response which must follow from an "official" declaration of famine. But it is hoped that the first official use of the term in Africa since Band Aid 27 years ago will stand as a "wake-up call" to governments, including some in Europe and almost all in Africa, who have so far failed to respond. The Telegraph reports that world's richest countries guilty of 'wilful neglect'. The world's richest countries are guilty of "wilful neglect" in failing to fund appeals to save millions of Africans from falling into famine, aid agencies said on Wednesday. Less than a fifth of the £650m urgently needed for the Horn of Africa has been pledged, Oxfam said, with the response from most of Europe "surprisingly slow". "THERE HAS BEEN A CATASTROPHIC BREAKDOWN OF THE WORLD'S COLLECTIVE RESPONSIBILITY TO ACT," said Fran Equiza, Oxfam's director in the Horn of Africa. "Several rich governments [ie: the US] are guilty of wilful neglect as the aid effort to avert catastrophe in East Africa limps along. "THE WARNING SIGNS HAVE BEEN SEEN FOR MONTHS, and the world has been slow to act. By the time the UN calls it a famine it is already a signal of large scale loss of life." Aid agencies have taken out full-page advertisements in newspapers and launched appeals on television and radio, as 11 MILLION PEOPLE ACROSS KENYA, ETHIOPIA AND SOMALIA FACE THE THREAT OF STARVATION. Mark Bowden, the head of the UN's operations in Somalia, said as he announced the first official famine in Africa since Live Aid that "tens of thousands" of people had already died. "I'm not going to say it's not going to deteriorate further, it will," he said in Nairobi, Kenya's capital and the headquarters of the aid effort across the Horn of Africa. "Even if the world starts acting as must, now, lives will be lost. But there are many more lives that can be saved if we see the level of response that is desperately needed." Aid workers point out that weather reports and famine early warning systems operating in Somalia had predicted extreme shortages of food as long ago as January. "The announcement of a famine across much of east Africa is as tragic as it is predictable," said Jeremy Hulme, chief executive of the Society for the Protection of Animals Abroad. "It's scandalous that we're seeing this AVOIDABLE tragedy unfolding across the region," Mr Hulme added. Using its Wurlitzer (propaganda machine), the ESF censures and downplays all news of famine to the best of its ability. This is highly effective: people don't donate to or urge their governments to support a cause they don't know exists. The result is that millions starve while aid agencies bemoan the tragedy. It also makes global food prices a little cheaper. One easy way for the ESF to keep food cheap is the squeezing farmers. And so the US has had a "cheap food policy" for a very long time. For a modern example of the continuing practice of squeezing farmers, The Guardian reports that British farmers forced to pay the cost of supermarket price wars. Farmers do not talk about these things. Many of them, during a month-long investigation, told the Observer that in the midst of the downturn they dare not risk annoying the big processors and shops. There is a "climate of fear" – the National Farmers Union's phrase – in the monopolistic world of modern food retail: small producers are too frightened to speak out about the abuses that are impoverishing them because they risk "reprisals", which may mean losing the only customers there are. Very few felt able to speak to us on the record. "One year Sainsbury's refused all my raspberries after we'd picked and packaged them," he said. "So the producer organisation [the intermediary the supermarkets insist on dealing with] sold them to Somerfield and we had to buy new packaging. But they all went on as a two-for-one offer: we had no say. At one point we were being paid less per punnet than it cost to put a lid on it. "I used to grow tree-matured Cox for Waitrose – in the last year with them the fruit got lost in the organisation's system and I got a much lower price than I'd been promised. It took nine months to get paid. So I said I wanted to quit. At least one dairy farmer has gone out of business in Britain every day for the past decade, as supermarkets have more than doubled their share of the price of a pint of milk. As many as 30 pig farmers have gone bust in the past year, according to the National Pig Association. At the heart of the problem, say campaigners, is public ignorance of how supermarkets buy produce and the system that allows them to offer lower prices while increasing their profits. Tesco's profits were above £3.5bn for the first time last year, and Sainsbury's rose by nearly 13%. These results – despite the supermarkets' endless price wars – are achieved largely by getting suppliers to reduce their prices. Most sectors of British farming, from eggs to fruit, vegetables and pork, have seen farm-gate prices drop in the past year, despite record increases in costs. "Supermarkets have handed the risk back to us: they charge ever-increasing markups, force us to take part in promotions," one Welsh farmer in vegetables and dairy told the Observer. "The farmer takes all the risk, pays all the costs and gets virtually nothing above the price of production." Discounts such as "buy one get one free" are not a generous gift from the supermarket. What they mean is that the farmer will be paid less – but he or she has no ability to negotiate or even be informed if their crop is put on special offer. If a crop has been over-ordered and doesn't sell, the supplier may have to pick up the cost of disposal. Fruit farmers contacted by the Observer said they had seen their produce on sale in supermarkets FOR LESS THAN IT WOULD HAVE FETCHED ON THE SAME DAY AT THE WHOLESALE MARKET. … Yet contracts still oblige them to continue supplying. Right now, the food consumers buy at the supermarket is artificially cheap, thanks to the continuing “cheap food policy”. When the ESF’s dollar Ponzi scheme collapses, this will end and farming will become more profitable. Prices are set by supply and demand, and there are two types of demand for agricultural commodities, end user demand and investment demand. In other words, both soybean crushers (user demand) and pension funds (investment demand) both “buy” for example soybeans (although they do it for different reasons). The demand from soybean crushers (they actually want delivery of soybeans) can’t be negated by financial means, but the investment demand from pension can. By naked short selling (commodity IOUs) agricultural and other commodities, the ESF unnaturally removes the investment demand from the market, lowering prices. As an example of how the government is shorting agricultural commodities, watch my video on AIGFP's Massive Short Position In Commodities (which now belongs to the government). This naked short selling is reaching ridiculous levels. For example, look below at the amount of soybean export sales outstanding (which is at absurd levels for this time of year). There is a huge, growing backlog of unfilled orders for US soybeans (soybean IOUs). 1) If people believe that there is a looming oversupply of something (housing, oil, food, etc…), they will sell right way and hold off on buying in anticipation of lower prices. This immediate selling and delayed buying has an effect on supply and demand, lowering prices. 2) If people believe that there is a looming shortage of something (housing, oil, food, etc…), they will buy right way and hold off on selling (hoarding) in anticipation of higher prices. This immediate buying and delayed selling has an effect on supply and demand, raising prices. In its desperation to keep food prices down, the ESF, through the United States Department of Agriculture (USDA), has been badly distorting the perception of supply and demand in agricultural markets. This temporarily delayed a rise in food prices but guaranteed a worse crisis later. I described this dynamic in my article on the *****2010 Food Crisis for Dummies*****. Early in 2009, the supply and demand in agricultural markets went badly out of balance. The world was experiencing a catastrophic fall in food production as a result of the financial crisis (low commodity prices and lack of credit) and adverse weather on a global scale. Meanwhile, China and other Asian exporters, in effort to preserve their economic growth, were unleashing domestic consumption long constrained by inflation fears, and demand for raw materials, especially food staples, was exploding as Chinese consumers worked their way towards American-style overconsumption, prodded on by a flood of cheap credit and easy loans from the government. Normally, food prices should have already shot higher months ago, leading to lower food consumption and bringing the global food supply/demand situation back into balance. This never happened, because the USDA, instead of adjusting production estimates down to reflect decreased production, has been adjusting estimates upwards to match increasing demand from china. In this way, the USDA has brought supply and demand back into balance (on paper) and temporarily delayed a rise in food prices by ensuring a catastrophe in 2010. The USDA, by manufacturing the data needed to keep supply and demand in balance, has ensured that agricultural commodities are incorrectly priced, which has lead to overconsumption and has guaranteed disaster next year when supplies run out. Specifically, the USDA has declared half the counties in the Midwest to be primary disaster areas this year, including 274 Midwest counties in the last 30 days alone. These designated are based on the criteria of a minimum of 30 percent loss in the value of at least one crop in a county. The chart below shows counties declared primary disaster areas by the Secretary of Agriculture and the president of the United States. The same USDA that is predicting record harvests is also declaring disaster areas across half because of catastrophic crop losses! To eliminate any doubt that this might be an innocent mistake, the USDA is even predicting record soybean harvests in the same states (Oklahoma, Louisiana, Arkansas, and Alabama) where it has declared virtually all counties to have experienced 30 percent production losses. It isn’t rocket scientist to realize something is horribly wrong. 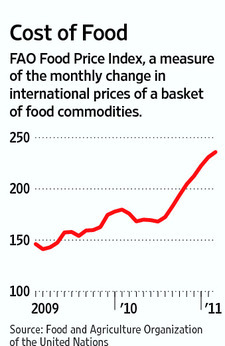 The 2010 food crisis began last June, and food prices have been going straight up ever since (look at graph at the top of this entry). USDA Estimates kept prices cheap for a while until physical shortages started showing up in the middle of 2010. Lets start with a recent example. Earlier this year every major media (controlled by the ESF) began blasting a study linking diet soda to stroke and heart attacks. CBS News reports that we should all drink water. Diet Soda Stroke Risk? Will Health Police Let Us Drink ANYTHING? (CBS) Think diet soda is a healthy alternative to sugar-sweetened pop? Think again. The health police are out with a new study showing that people who drink diet soda are much more likely to have a heart attack or stroke than are people who don't drink soda of any kind. … given her findings - and given the fact that diet soda has no nutritional value - the study's lead author said GIVING UP SODA MAKES SENSE. "Eliminating it from your diet isn't necessarily a bad idea," Dr. Hannah Gardener, an epidemiologist at the University of Miami Miller School of Medicine, tells CBS News. So what else is there left to drink? Says Gardener, "I'm a big fan of WATER." Of course, the link between Diet Soda and stroke is utter nonsense. ATLANTA (February 10, 2011) – The Calorie Control Council stated today that research findings presented during a poster session at the International Stroke Conference claiming an association between diet soft drink consumption and increased risk of stroke and heart attack are critically flawed. "The findings are so speculative and preliminary at this point that they should be considered with extreme caution. In fact, the study has not been peer reviewed by any independent scientists and has not been published in a scientific journal," stated Beth Hubrich, a registered dietitian with the Council. The research, as well as the publicity regarding the study abstract, is drawing a growing body of criticism and skepticism from experts in the field of nutrition and science. "I have to say, this is one of the worst studies I've seen capturing headlines in a long time,” said Dr. Richard Besser, Chief Health and Medical Editor at ABC News, commenting during a February 10 segment on Good Morning America. "It's bad because of the science, but it's also bad because of the behavior that it can induce and the fear that people have. I DON'T THINK PEOPLE SHOULD CHANGE BEHAVIOR BASED ON THIS STUDY." Pointing out some of the flaws in the study, Besser added, "They didn’t look at how much salt they took in, they didn't look at what other foods they ate. Those things we know are associated with stroke and heart attack. They didn't even look at obesity over time. And so to conclude from this, that it's all from the diet soda, just makes no sense whatsoever." The diet soda is sweetened by high fructose corn syrup and corn prices were hitting record highs when "diet soda=stroke" propaganda was launched. Getting Americans to switch from diet soda to water would lower demand and help bring down soaring corn prices. Another larger and ongoing example of the effort to contain food prices through propaganda is the vegan movement. Since livestock production requires more resources to feed the same number of people that crops do, anyone switching to a vegan diet is helping the ESF lower food prices. Meat producers (farmers) operate with a high fixed-cost, low variable-cost business model. In other words, their profits are volume driven, and are usually constrained primarily by the size of their facility. As a result, their profits are highest when they produce as much livestock as possible. Since livestock is a commodity, the individual producers have little control over price, but they have buyers for as much as they can produce. Therefore, they will not reduce output in response to demand fluctuations. THEY WILL, however, SELL AT A LOWER PRICE if necessary, to sell all of their output. SO IF COLLECTIVELY VEGETARIANS REDUCE DEMAND FOR MEAT, production is not lowered, PRICES ARE. However, meat prices continue to rise, as demand increases. Besides, even if they DID reduce output, you cannot save something that never existed. That would be like me saying that I have saved children from miserable lives by wearing a condom. As long as farmers aren't providing care for unsold livestock until their natural death, vegetarians aren't saving animals. Like so much of what the ESF does, the consequence of its vegan propaganda are deadly. Skip to next paragraphThis particular calamity — AT LEAST THE THIRD SUCH CONVICTION OF VEGAN PARENTS IN FOUR YEARS — may be largely due to ignorance. But it should prompt frank discussion about nutrition. Thanks to ESF propaganda, the diets of millions have been artificially distorted with tragic consequences. This has helped lower food prices. 1) The dollar’s collapse is imminent. The current food crisis (remember millions are starving) will only grow worse, and it will ultimately force a mass liquidation of foreign reserves (selling of dollars) by central banks (like China) who are desperate to contain domestic unrest (food riots). 2) Once the ESF’s dollar Ponzi scheme is over and its frauds/propaganda exposed, the effects of all its “cheap food” schemes will begin to reverse. There will be a crackdown on food substitution, a switch to more sustainable farming practices, contaminated food will be taken off the market, etc… This will drive food prices much higher on a permanent basis. 3) This will have a drastic effect on the global economy (separate from the effects of the dollar’s collapse). You see, when food prices go up, demand for everything else goes down. Sales of all types of consumer goods will suffer as the world goes back to spending a lot more money on food. Farming will become much more profitable. 4) Of all the ESF frauds, nothing rivals the harm it has done through its “cheap food” scheme. The world has 6.9 billion people BECAUSE food has been artificially cheap and plentiful. Once food prices and availability go back to normal, there is going to be an unbelievable loss of life. Before I got sidetracked (see the video series on the ESF's history), I was working on setting an investment in Russian agriculture. I am now picking up where I left off. Nothing (even gold) will outperform farmland over the next few years, and Russian farmland is ridiculously cheap. Please email me if you’re interested. Also, having wrapped up most of what I needed to blog about (this entry, the ESF's history, etc…) and with the dollar’s collapse getting near, I is soon time for me to start looking for a real job. If anyone has any ideas about this, please email me. Great Post Eric. I think India needs to tryBrawndo, it's what plants crave. Also, I would agree that a vegan diet is at the edge of survivability, but if you include href="http://en.wikipedia.org/wiki/Sprouting">sprouting, as part of your menu it will give you the essential amnio acids and complete proteins often missing from a vegan diet. If what you layout here does in fact happen and skyrocketing food prices come to pass, sprouting may be the only way many people are able to survive the "readjustment". Thanks for the vast amounts of research you put into this article. I have spent years refusing to buy farm-raised fish and shrimp, and not eating at fast-food restaurants. Now I will not buy any shrimp because it could be from the Gulf, and I will probably have to stop buying canned tuna and commercial eggs. I no longer trust labeling. The best thing to do is either grow it yourself or buy local produce and hope for the best.